Last week, on my way down to New York City, I stopped at Cornell University to see their new Architecture, Art and Planning building, Milstein Hall. 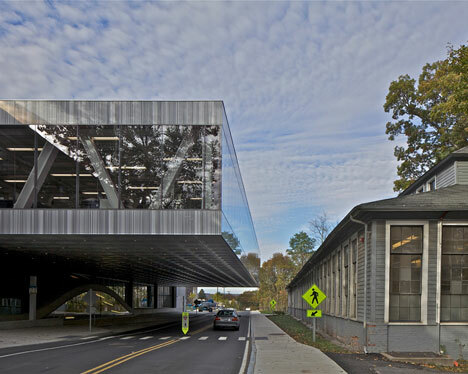 The OMA-designed facility looks like a Mies van der Rohe-style box propped up on a concrete ant hill, floating not incongruously between the kind of Victorian and Georgian structures one imagines at an Ivy League school. Some of the design is quite subtle — part of the exterior is clad in elegantly stripped Turkish marble — while some of it is showy and loud — a giant, 50-foot cantilever reaches over University Ave., almost-but-not-quite touching the 150-year-old Foundry Building across the road. I wasn’t sure if this latter gesture was an act of aggression — like a bully announcing its presence to a meek, helpless victim — or one of kindness, like an outstretched hand between a young spunky kid and an old, fair lady. This ambivalence basically describes my reaction. What I liked: The building is porous. As people walk or bike by, there are interesting opportunities to look into spaces that are normally much more cloistered in a school: a lecture hall that has windows on three sides, or a submerged auditorium/crit space with large clerestories. That sense of openness is amplified inside, with 25,000-square-feet of connected studios that house both graduate and undergraduate students. The studios are sky lit and have floor-to-ceiling windows, so students aren’t cut off from Cornell’s impressive natural surrounds — the university is basically set in the middle of cottage country, near a lake, waterfalls, forest trails and a gorge. I also think there’s something to be said for the way Milstein Hall connects to the two century-old buildings beside it (Rand and Sibley halls), both physically (by joining a previously disparate faculty) and aesthetically: the underside of the facility is covered with pressed aluminum panels that look sort of like Victorian-era tin ceilings. It’s a bit kitschy, but I think it’s fun. What I didn’t like: Sometimes I felt the architecture lacked sensitivity. The seemingly hovering buidling is striking from a distance, but the open spaces underneath can be dark (even in the afternoon when I went). As an attempt to mitigate this, there’s a series of strange, glowing bulbs, popping out of the concrete (slugs attacking the ant hill?). But they don’t really glow bright enough, and they aren’t proportioned right for sitting comfortably on, or arranged in a way to really feels inviting, so they feel a bit useless. 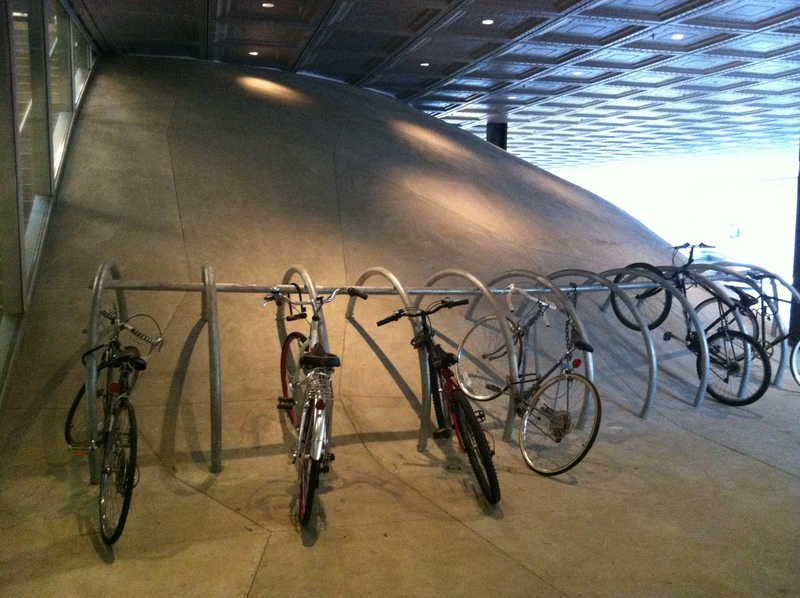 Likewise, the bike racks look like an afterthought. Is that seriously the best way to lock up a bike? Wouldn’t it work better if it were accessible from both sides? This might seem like an insignificant detail, but for students, bike locks are like liquor stores and coffee shops: their always need to be one close by. There’s also something dour to me about the interiors of the lobby and the subterranean auditorium. 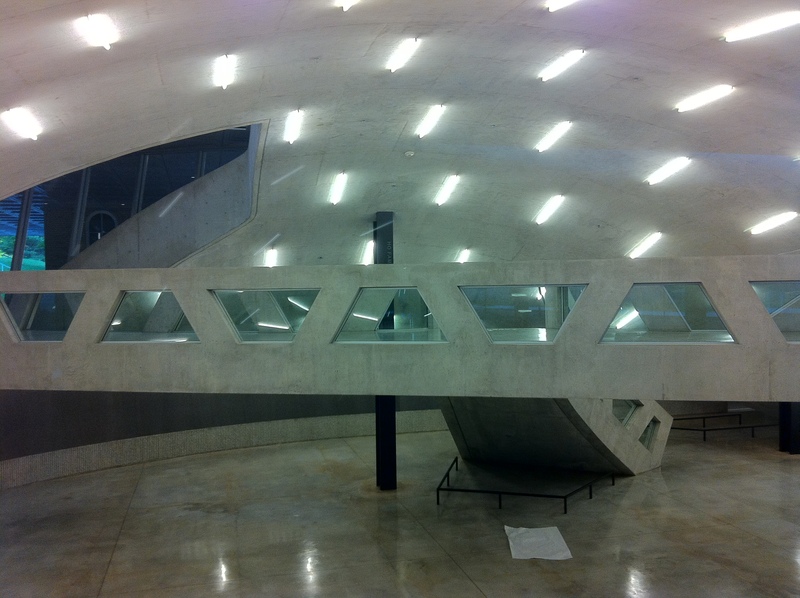 The shape of the space is compelling, but the materiality makes it feel like a bunker and the lighting is harsh. That said, I’m glad I went and saw it. I wish I could have spoken to a student to see what they thought of the building. After coming home, though, I watched this video where an undergrad listed the clean, new floors among his reasons for liking it. I’m sure that Rem Koolhaas, Shohei Shigematsu and the other designers at OMA are thrilled by that reaction. 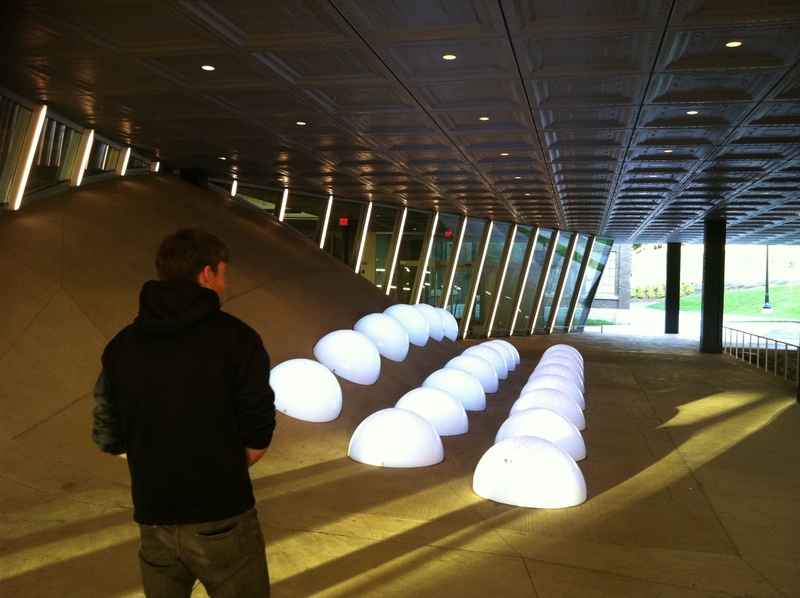 This entry was posted in Design Spy, The Critic, The Great Outdoors and tagged Architecture, Auditorium, Bike Racks, Concrete, Cornell University, Design, Lecture Hall, Milstein Hall, OMA, Rem Koolhaas, Shohei Shigematsu, Travel by mmhague. Bookmark the permalink.